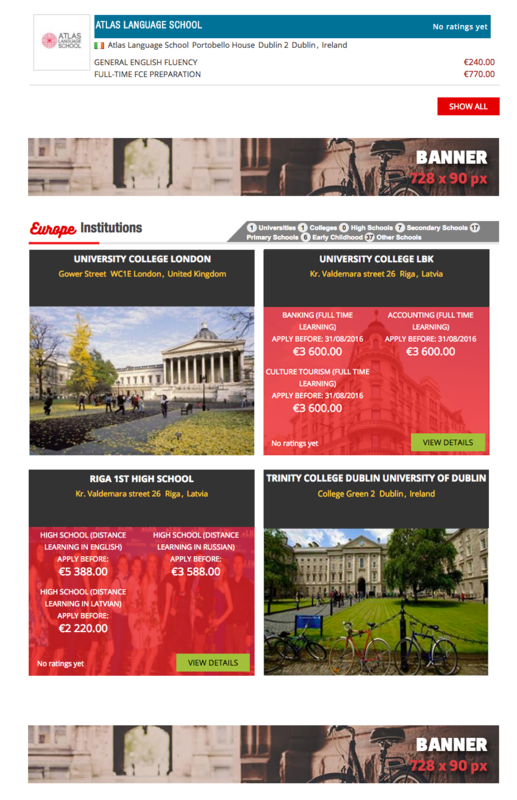 Promote your institution in eye catching locations of the portal in your country and Institution Type of choice. Are you an Educational Institution or Service Provider? The images used to advertise on the Unipupil portal need to meet the following technical requirements. Note: Any picture outside of these dimensions will be automatically scaled to fit and/or cropped, with user choosing the Display portion, required. Based on the type of display advertising you choose, it will be displayed on different places within the page and different locations throughout the Unipupil portal. Location: Top of Page. The Leaderboard is displayed on the Unipupil portal bar at the top of all pages. Qualifiers: This display option is restricted to Educational Institutions only who are signed up on the portal. Qualifiers: This display option can be purchased by any educational institution or by service provider companies who provide support services for educational institutions. Location: Top Right of Pages. The MPU portrait will display on the top right of pages. Location: Right Column The Skyscraper will display on the Unipupl contact page, on the FAQs Student page and Sign Up pages. Qualifiers: This display option can be purchased by any educational institution or by by service provider companies who provide support services for educational institutions.